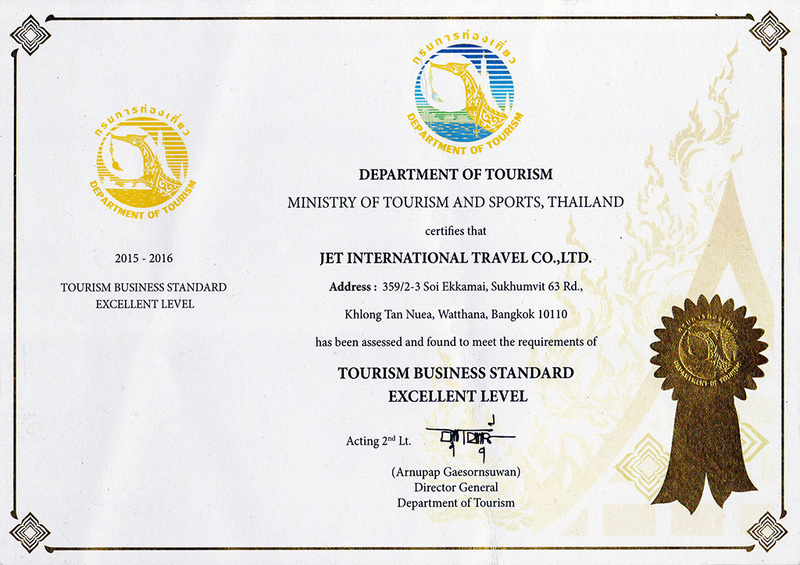 2015-2016 was awarded TOURISM BUSINESS STANDARD (EXCELLENT LEVEL) award from Department of Tourism. 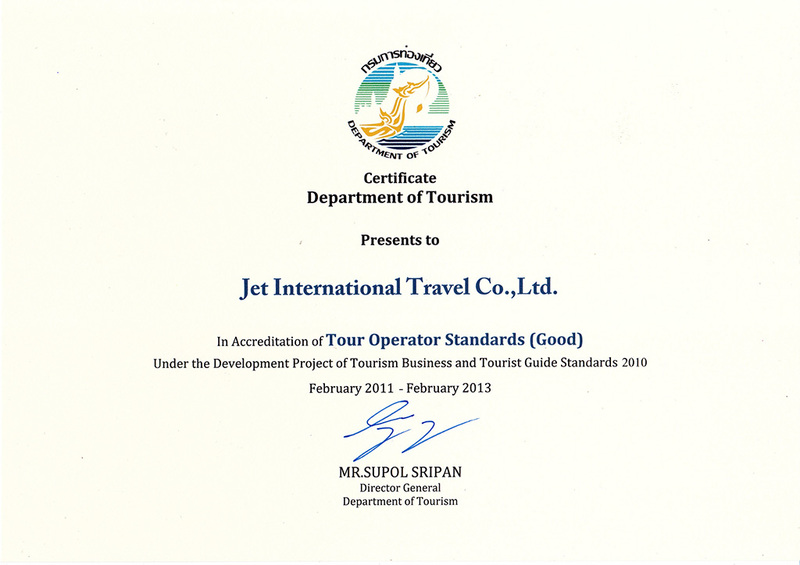 2011-2013 was awarded TOUR OPERATOR STANDARDS (GOOD LEVEL) award from Department of Tourism. 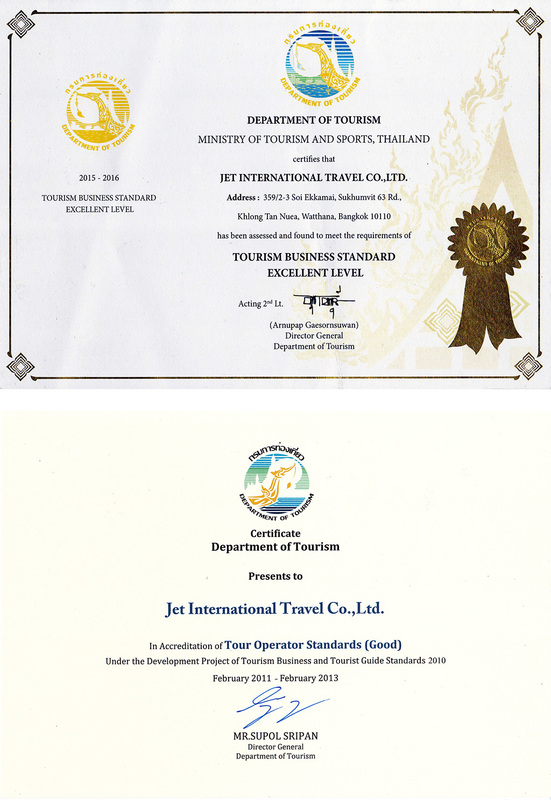 Jet International Travel Co., Ltd. tourism business undertaking license No. 11/00378, was established on September 1, 2003 by acquiring S.M.T. World Travel Co., Ltd.’s shares (which was established in 1983). The company’s name was later changed to be Jet International Travel Co., Ltd., which has been running tourism business. Jet Inter was registered as Billing and Settlement Plan agent (BSP agent) distributing air tickets of all airlines by reserving seats through Amadeus, Sabre, Galileo systems, as well as reserving seats of Air Asia, Nok Air, Tiger Air airlines and other airlines. The Company is certified by International Air Transport Association (IATA). Jet Inter maintains standard of integrated traveling services for desired forms of chartered tours both domestically and internationally, such as for development of organizations’ human resources, seminar arrangement, creation tourism, Corporate Social Responsibility (CSR) etc. 1. Service offering to be qualitative and standardized and best paying attention to the customers. 2. Improve, develop, pioneer traveling routes so as to increase options for you as much as possible. 3. Offer services to respond to your intention as much as possible. Traveling activity for employees or customers for good relationship and helping them to be relaxed from work. It is aimed at the employees’ being enjoyable and relaxed from strain by traveling in various tourism places, enjoyable with variety of activities, depending on suitability of the places, including marine or land activities, and enjoyable with dinner party as our teamwork will create atmosphere resulting in your being hilarious so as to be reward for you and help creating increased relationship within the organization for the employee. Traveling activity to create and develop the organization to be more efficient at work. Moreover, it is creating unity within the organization as traveling will concentrate on natural tourism places, resorts or hotels with arrangement of onsite meetings, seminars, or training in various courses depending on your topics. Integrated traveling activity is mixed while relaxed traveling. While activities of development of organization and personnels will be meddled for the employees to be enjoyable and harmonized which increases more value for your traveling. The activity will be arranged by our teamwork who are specialized in running activities in terms of recreation and meaningful communication. Jet Inter is service provider of integrated group tour, package tour, air ticket distribution, arranging integrated group tour, package tour, distributing air tickets, reserving seats both domestically and internationally, giving advice of visa application, with true intention with much experienced teamwork from real work with works being trusted by the country’s leading agencies and companies all along. Consequently, Jet Inter is really hopeful to have opportunity to offer service to you for your valuable relaxation. Jet Inter is very specialized in arranging group tour in accordance with your desirable forms both domestically and internationally, such as developing the organization’s human resources, activity tourism, educational tour, onsite study trip, arranging meetings and seminars, arranging exhibition, Corporate Social Responsibility (CSR), paying attention to service in detail to be standardized. The Company was awarded Excellent Level award from Department of Tourism and has been trusted by leading agencies and companies in the country for our services continuously in several traveling routes in many countries. Jet Inter was registered as Billing and Settlement Plan agent (BSP agent) distributing air tickets. The Company is certified by International Air Transport Association (IATA), directly distributing air tickets of all airlines. You can reserve air tickets of all airlines both domestically and internationally with confidence and special prices. Since the past until now, many leading companies in the country have been trusting the Company’s seat reservation service of airlines for some time. Package tour, both domestically and internationally, is suitable for you who want to travel freely and privately in your specified date and time. Reserve accommodation both domestically and internationally. Visa, Give advice and proceed to apply for visa as well as give advice on preparing documents for you to be convenient and rapid. © 2016 Jet International Travel Co., Ltd.